It’s clear to see why Amazon’s Kindle is leader in the world of ebook. Just like Apple’s ipod changed the way we listen to music, the Kindle is revolutionizing the book world, offering easy-to-use hand-held personal digital libraries. Amazon.com is the largest digital library on the planet, user can download new titles to your electronic reader without ever going to a book store. Kindle ebook support multi platform include windows, mac, iphone and ipad, user can read kindle ebook in PC, Mac,iPhone and iPad, but it can’t read in other brand e-reader, like Sony e-reader, NOOK. You aren’t a IT guy, is there a easy way to convert Kindle ebook to PDF file? 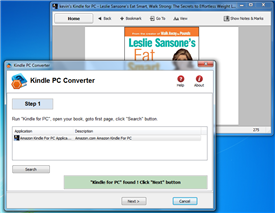 Kindle PC Converter is tools that generate PDF file from Kindle ebook. it support windows 7/vista/xp, quickly and easily converted ebook to PDF file formats. user can view PDF ebook on other computer or device, user also can print Kindle ebook without limitation. 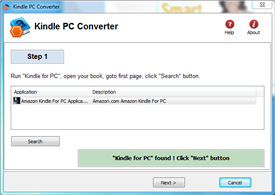 1 Download Kindle PDF Converter here and install it. 2 Run Kindle PC first, open your ebook. 3 Run Kindle Converter, click ‘next’ button to go to step 2. 5 Click “Capture” button to start working, do touch computer when it is working. A few important things to remember, converter able to generate 2 kind of PDF file, one has A4 paper size, similar as letter paper size, this PDF was easy to read in PC, another one has smaller page size that optimized for e-reader, user will get good result to read this kind of ebook in other brand e-reader. Watch the full video of the Kindle to PDF conversion here.